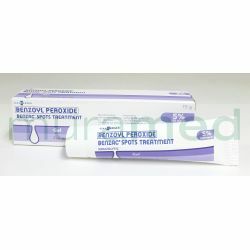 Used in the treatment of acne or pimples. Apply on the affected area 1-2 times a day, or as prescribed by the doctor. For external use only. Avoid contact with eyes, lips, & mouth. May bleach dyed fabrics. Caution use in pregnancy. Mild skin irritation, dryness, burning, itching, or peeling. This product should not be used by patients with known hypersensitivity or allergy to benzoyl peroxide or to any of its components.